Happy Labor Day weekend! Hopefully you are all out and enjoying the last long weekend of summer. Since holiday weekends usually bring cookouts, today’s recipe fits right in! 1. Make 24 yellow cupcakes according to box directions; make the brownie mix or chocolate cupcakes according to box directions. 2. Make the sugar cookie dough according to box directions — and use the cutout cookie instructions. Most mixes will have instructions for both drop sugar cookies and cutout cookies. Roll out the dough and cut into thin strips. Bake strips at 350F for about 8 minutes, or until the sides are golden brown. If your “fries” have expanded too much, cut them in half immediately upon removing from the oven — this will ensure thin enough “fries”. Sprinkle with sanding sugar to replicate salt. 3. Once the cupcakes and brownies have cooled, remove the cupcakes from their paper liners. 4. Cut each cupcake in half – and use a 2″ round cookie cutter to cut into the brownies. When you’re finished, you’ll have the buns and burgers! 5. Dye the vanilla frosting red, yellow, and green to serve as ketchup, mustard, and lettuce. If I were to do this again, I would have used a deeper red coloring — as my ketchup looks pink! 6. 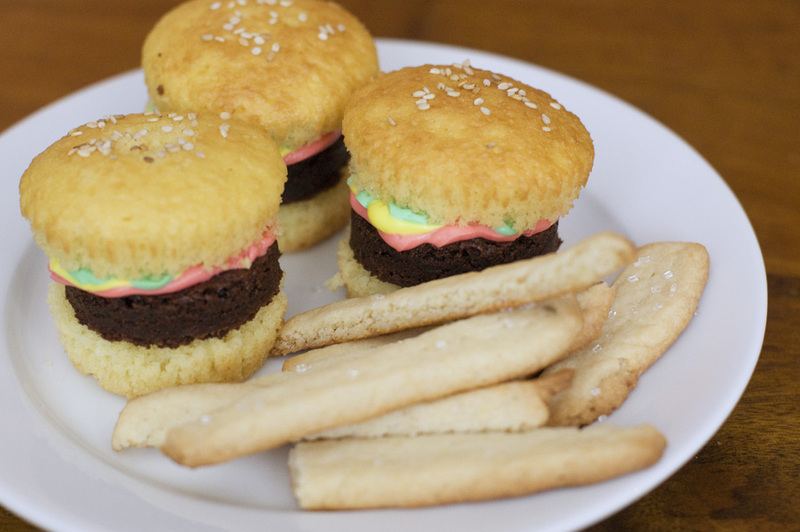 Assemble the “burgers” and use a piping bag to add the colored frostings. 7. Brush a thin layer of water over the tops of the cupcakes – and sprinkle with sesame seeds.